Scars are a consequence of cutaneous wound healing that can be both unsightly and detrimental to the function of the tissue. Scar tissue is generated by excessive deposition of extracellular matrix tissue by wound healing fibroblasts and myofibroblasts, and although it is inferior to the uninjured skin, it is able to restore integrity to the boundary between the body and its environment. Scarring is not a necessary process to repair the dermal tissues. Rather, scar tissue forms due to specific mechanisms that occur during the adult wound healing process and are modulated primarily by the inflammatory response at the site of injury. Adult tissue-derived mesenchymal stem cells, which participate in normal wound healing, are trophic mediators of tissue repair. These cells participate in attenuating inflammation in the wound and reprogramming the resident immune and wound healing cells to favor tissue regeneration and inhibit fibrotic tissue formation. As a result, these cells have been considered and tested as a likely candidate for a cellular therapy to promote scar-less wound healing. This review identifies specific mechanisms by which mesenchymal stem cells can limit tissue fibrosis and summarizes recent in vivo studies where these cells have been used successfully to limit scar formation. Adult human skin is limited in its ability to repair itself following injury that penetrates beyond the epidermis. The cutaneous wounding healing process results in the formation of a scar that is composed of excess extracellular matrix (ECM) in the place of the normal dermal tissue. Besides having a different visual appearance, which can be undesirable, the tissue in the vicinity of the scar does not function like the surrounding skin, as it does not contain many of the structures that are native to the dermis, including sebaceous glands, hair follicles and sensory nerve receptors . The scar tissue is also limited to approximately 80% of the tensile strength of the surrounding skin  and results in a weak point that is susceptible to re-injury. However, scar formation is not required for cutaneous healing, as wound healing occurs in the absence of scarring throughout most of fetal development (reviewed in ). There has been considerable scientific effort to understand the mechanism of cutaneous scar formation with the goal of developing potential therapies to promote scar-less wound healing. Despite the deleterious consequences of fibrosis and scar tissue formation, current treatments to promote scar-less wound healing are primarily limited to the standard principles of wound management. These include the use of topical antibiotics and sterile dressing in order to minimize the risk of infection to advance the wound healing process through the inflammatory phase and into the cellular proliferation and remodeling phases , where functional tissue regeneration can occur. Irrigation and debridement of the wound may be applied as necessary to remove foreign bodies and necrotic tissue that can promote tissue inflammation . If the inflammatory phase is prolonged, the pro-inflammatory mediators will direct the wound healing cells, such as myofibroblasts and fibrocytes, in generating the non-functional, void-filling tissue that will result in the formation of a scar . Mesenchymal stem cells (MSCs), which appear to be a native constituent of the wound bed , have emerged as an alternative to the standard pharmaceutical treatment modalities. These cells are important trophic mediators to promote tissue regeneration and can be readily derived from a variety of autologous or allogeneic adult tissues, as well as from commercial providers . The versatility of these cells has made them an attractive candidate for clinical translation in a variety of therapeutic applications. In particular, MSCs may offer the means of recapitulating several mechanisms that are sufficient for inhibition of scar formation in skin wounds (Figure 1). This review will provide an overview of current research into cutaneous wound healing with an emphasis on specific mechanisms by which MSCs may enhance functional tissue regeneration. Mesenchymal stem cells can influence cutaneous regeneration by multiple distinct mechanisms acting on multiple cell types. HGF, hepatic growth factor; MSC, mesenchymal stem cell; RNS, reactive nitrogen species; ROS, reactive oxygen species. MSCs are a broadly generalized cell type that can be found in a variety of adult tissues throughout the body and exhibit specific characteristics when cultured in vitro . In particular, MSCs must be capable of robust ex vivo expansion and maintain the ability to differentiate into osteoblasts, adipocytes and chondrocytes. 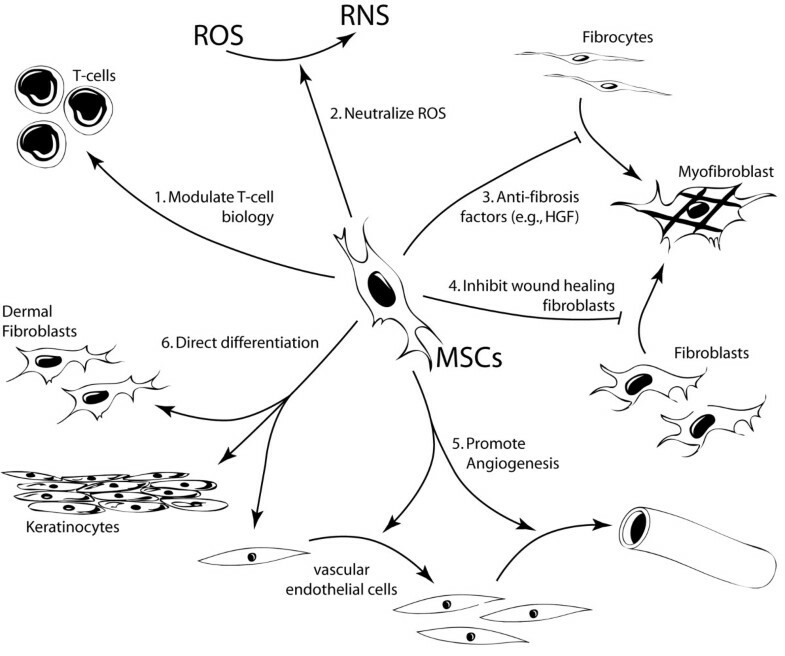 Many recent studies have also demonstrated that MSCs exhibit a number of trophic functions to enhance tissue regeneration, such as promoting angiogenesis and modulating the inflammatory response (reviewed in ). Originally harvested in the adherent fraction of cells in a bone marrow aspirate , MSCs have since been identified in a variety of other adult tissues, including adipose tissue [11, 12], the marrow space of long bones [13, 14], trabecular bone chips [15–17], periosteum [18, 19], synovial fluid [20–22], periodontal ligament [23, 24], palatine tonsil , parathyroid gland , fallopian tube  and traumatized muscle tissue [28, 29]. MSCs have also been harvested from prenatal tissues that are lost as a result of development, such as umbilical cord [30, 31], umbilical cord blood/Wharton's Jelly [32, 33] and primary tooth dental pulp [34, 35]. There is a growing body of evidence to suggest that a substantial fraction of the cells exhibiting the in vitro characteristics of MSCs arise from vascular pericytes in vivo , suggesting that there is a common precursor cell type in a wide variety of adult and fetal tissues. Given their regenerative functions, availability and potential for cell banking , there is immense interest in developing cellular therapies based on autogenous or allogeneic MSCs. The basic biology of wound healing has been extensively studied (reviewed in ), and MSCs are clearly capable of responding and modulating their function when exposed to the cells and biochemical factors that are characteristic of an injury environment. Human MSCs migrate preferentially to regions of inflammation  and express several chemokine receptors that are necessary to coordinate their homing ability . Furthermore, MSCs have demonstrated chemotaxis toward a variety of wound healing cytokines in vitro, including platelet-derived growth factor, insulin-like growth factor-1, IL-8 and TNFα [40, 41]. These data suggest that bone-marrow-derived MSCS or endogenous cells resembling MSCs, such as pericytes, are likely to migrate to and participate in the response to tissue injury. There is ample evidence based on murine models of injury and disease to demonstrate that systemically administered allogeneic MSCs are capable of homing to and engrafting at the site of tissue damage [42, 43]. Several recent studies have further quantified the extent of bone marrow-derived MSC involvement during wound healing. A chimeric mouse model was developed to evaluate MSCs by lethally irradiating female C57BL/6 mice, followed by replacement with fluorescently labeled MSCs from male BALB/c mice in the bone marrow . These mice demonstrated gradual engraftment of the donor cells in the dermis as the bone marrow-derived MSCs participated in the process of dermal regeneration, and fluorescent cells in the regenerated tissue also exhibited markers of dermal fibroblasts. Furthermore, the number of green fluorescent protein-labeled cells in the dermis increased approximately 400% in regions that experienced cutaneous injury , suggesting that recruitment from the bone marrow occurred at the site of wound healing. As with other populations of marrow stromal cells, the mobilization of MSCs appears to be dependent on systemic levels of granulocyte-colony stimulating factor (G-CSF), and homing to the site of injury is dependent on local expression of stromal cell-derived factor (SDF)-1 . Exogenous administration of either G-CSF or SDF-1 is sufficient to increase MSC recruitment to the site of injury and corresponds to enhanced wound healing at the sites of MSC recruitment. One likely function of MSCs in the process of wound healing is to regulate the function of the leukocytes that have invaded the tissue in response to injury [47, 48]. Once the MSCs enter the inflammatory environment, their immunomodulatory phenotype becomes activated by IFNγ, TNFα and IL-1β . The ability of MSCs to regulate T-cell recruitment, proliferation and activity is well documented [49, 50]. There is also evidence that MSCs are capable of suppressing the proliferation of B cells  and natural killer cells , thereby ameliorating the acute immune response to injury. By attenuating the function of these cell types, the MSCs would likely reduce the pro-fibrotic responses that can occur coincident with prolonged inflammation during wound healing [53, 54]. However, a variety of other likely mechanisms by which MSCs could suppress fibrosis and the formation of scar tissue are discussed below. During the transition between the inflammatory and proliferation stages of wound healing, macrophages resident in the wound undergo a change in phenotype to an alternative activation (M2) state. IL-4 and IL-13 are the archetypical activators of the M2 phenotype , and there is evidence that IL-4 may be produced by mast cells that migrate from the margins into the wound bed during this stage of healing . The precise alternative phenotype of the macrophages during cutaneous wound healing has not been fully defined, as the M1/M2 macrophage model varies somewhat between tissue types . However, alternative macrophage activation is generally characterized by decreased expression of pro-inflammatory cytokines accompanied by an increase in anti-inflammatory signaling . This shift in inflammatory modulation is accompanied by the expression of cytokines that promote tissue regeneration, such as heparin bound epidermal growth factor (HB-EGF), fibroblast growth factor (FGF)-2 and vascular endothelial growth factor (VEGF) . HB-EGF signaling to keratinocytes provides additional stimulus to promote re-epithelialization and the formation of a new epidermal layer . FGF-2 and VEGF promote the proliferation and migration of fibroblasts and endothelial cells into the fibrin clot . The inflammatory environment of the wound activates the MSCs to initiate their immunomodulatory functions, including an increase in cyclooxygenase-2 activity and up-regulation of prostaglandin E2 (PGE2) expression , which has multiple fibroregulatory effects on the wound. In particular, PGE2 plays a necessary role in the immunoregulatory mechanism of the MSCs to inhibit the expression of IL-2  and attenuate mitogenesis and proliferation of T cells in the wound . PGE2 is also a co-factor in the transition from TH1 cells into TH2 cells , corresponding to a decrease in the expression of INFγ and up-regulation of IL-4 by the effector T cells . The decreasing ratio of IFNγ relative to IL-4 in the wound promotes functions that are associated with the alternative activation of macrophages , which favor wound healing over inflammation and promote the activity of mesenchymal cells during the proliferation stage (reviewed in ). PGE2 expression results in other indirect fibroregulatory effects by interacting with immune cells that are resident in the wound. In response to PGE2, T cells  and macrophages  become reprogrammed and begin to express higher levels of IL-10, an important anti-inflammatory cytokine with multiple functions to limit or attenuate the inflammatory mechanism of immune cells . IL-10 is a powerful inhibitor of neutrophil invasion into the wound and prevents further oxidative tissue damage from their release of reactive oxygen species (ROS) . IL-10 may also have direct effects on fibrosis by down-regulating the expression of transforming growth factor (TGF)β1 in macrophages and T cells , and reprogramming wound fibroblasts to favor ECM remodeling by up-regulating the expression of matrix metalloproteinases (MMPs) and down-regulating the expression of collagens . IL-10 also prevents excessive collagen deposition by attenuating the expression of pro-inflammatory cytokines in the wound, such as IL-6 and IL-8 . As a result of these mechanisms, expression of IL-10 contributes to a resolution of the inflammatory stage and acceleration of the wound into the proliferation stage . The role of IL-10 in fibroregulation has been verified by demonstrating that scar-less wound healing can be abrogated in fetal mice by knocking out IL-10 , and then over-expression of IL-10 in post-natal skin generates a permissive environment where wound healing is more likely to occur with the absence of scar formation . MSCs substantially up-regulate the expression of inducible nitric oxide synthase in response to their interaction with T cells in a pro-inflammatory environment. Nitric oxide is complementary to PGE2 for the inhibition of T-cell proliferation , but there is evidence that it has other, more direct mechanisms to prevent the formation of scar tissue. ROS secreted by neutrophils, including super-oxide, hydrogen peroxide and alkyl peroxides, are highly cytotoxic compounds used to achieve wound sterility, but these ROS are also intensifiers of collagen deposition . Prolonged ROS exposure during wound healing leads to enhanced fibrogenesis and accumulation of fibrotic tissues through a mechanism involving membrane lipid oxidation and induction of TGFβ1 . Nitric oxide produced by MSCs in the wound can scavenge ROS to produce reactive nitrogen species, such as peroxynitrite . Although these reaction products are also oxidative and cytotoxic, they react more slowly than their associated ROS  and prevent oxidative damage to DNA and membrane lipids . A recent study has demonstrated that inducible nitric oxide synthase expression is sufficient to alter the ROS/RNS balance to prevent the formation of fibrotic tissues . MSCs secrete a variety of cytokines and growth factors that have anti-fibrotic properties, including hepatocyte growth factor (HGF), IL-10 and adrenomedullin [79–81]. The anti-fibrotic properties of IL-10 have been described earlier in this paper. HGF has also been shown to attenuate fibrosis and scar formation through a variety of mechanisms. Fibroblasts respond to HGF by down-regulating their expression of TGFβ1 , collagen type I  and collagen type III , as HGF receptor binding antagonizes downstream signaling cascades  and promotes the nuclear exclusion of SMAD 3, the transcription factor associated with many pro-fibrotic genes . HGF also stimulates the up-regulation of MMP-1, MMP-3 and MMP-13 expression in fibroblasts , thereby promoting the turnover of the ECM. In addition to fibroregulation of fibroblast function, HGF promotes keratinocyte migration, proliferation , and up-regulates their expression of VEGF-A . Therefore, the expression of HGF contributes to the generation of a high-quality, well-vascularized granulation tissue and enhanced re-epithelialization of the wound . There is also evidence for an additional anti-fibrotic mechanism of HGF by contributing to the inhibition of myofibroblast differentiation. Although contraction may facilitate re -epithelialization by narrowing the wound margin for alignment of ECM components , this process does not necessarily require fully differentiated myofibroblasts. Fetal wound healing occurs in the near absence of myofibroblasts . Furthermore, during oral epithelial wound healing, which is characterized by high levels of HGF and keratinocyte growth factor, rapid wound contraction occurs in the absence of robust myofibroblast commitment and yields less scar tissue compared to cutaneous wound healing . TGFβ1 is a potent driver of myofibroblast differentiation, and high levels of TGFβ1, which is often related to a prolonged acute inflammatory response, can lead to over-contraction, formation of tight collagen bundles and excessive matrix deposition with the visual appearance of a scar. In diseases caused by excessive fibrosis, HGF appears to resist the differentiation of fibroblasts into myofibroblasts , thereby limiting the pro-fibrotic functions that are characteristic of these cells. During the proliferation stage of wound healing, dermal fibroblasts from the wound margin proliferate and migrate into the wound, generate granulation tissue, and begin to remodel the wound matrix to generate new dermal tissue. However, there are additional sources of fibroblasts that may be recruited to participate in these wound repair processes, as is warranted by the extent of the injury. In response to elevated levels of TGFβ1, endothelial cells from damaged blood vessels may be encouraged to undergo epithelial-to-mesenchymal transition (EMT) and become wound healing myofibroblasts . Fibrocytes may also be recruited into the wound due to prolonged inflammatory response or when the wound matrix cannot be rapidly converted into granulation tissue , and the fibrocytes rapidly differentiate into myofibroblasts in the presence of TGFβ1 and T cells . Although these generic wound-healing fibroblasts may be needed to restore integrity of the skin after some types of injury, they produce excessive amounts of ECM compared to dermal fibroblasts, and they are more likely to yield a tissue with the visual appearance of a scar . MSCs resident in the wound can inhibit EMT by producing HGF  and PGE2 , and they can resist myofibroblastic differentiation as described in the previous section. MSCs also produce paracrine factors that promote specific wound healing functions of dermal fibroblasts . These combined mechanisms enable MSCs to regulate the cells populating the wound to favor resident wound healing cells to produce an ECM that more closely resembles the surrounding dermal tissue. Angiogenesis is a necessary process during the proliferation phase of wound healing to provide the fibroblasts with sufficient nutrient supply for the production of a provisional granulation matrix . Failure to generate an adequate microvascular network leads to deficiencies in wound closure and may develop into a chronic non-healing wound. Equally important is the need to stabilize the provisional vessels as the tissue remodels and to form a permanent vascular network. In addition to macrophages and fibroblasts, MSCs produce basic FGF and VEGF-A, which provide powerful mitogenic cues to promote proliferation, migration and differentiation of microvascular endothelial cells [99, 100]. MSCs also express paracrine factors to promote vascular stability and vasoprotection [101, 102], including adreno-medullin . It has been hypothesized that these functions are unique to MSCs due to their possible perivascular origin, and they are able to exploit these functions to recreate their perivascular niche as the process of vasculature remodeling is concluded . Enhancement of vascular formation by bone-marrow-derived MSCs has been demonstrated in vitro  and to facilitate the development of long-lasting functional vasculature as perivascular progenitor cells . MSCs are typically characterized based on their ability to differentiate into osteoblasts, adipocytes and chondrocytes in vitro. It is likely that MSCs in the wound environment may assume a phenotype that resembles that of the resident dermal fibroblasts or myoblasts, and this differentiation process has been recapitulated in vitro . More interesting and relevant is recent evidence demonstrating that MSCs may trans-differentiate to epidermal cells, keratinocytes and microvascular endothelial cells under defined conditions in vitro [39, 108, 109]. Finally, MSCs may also trans-differentiate into keratinocytes under conditions that allow them to interact with native epidermal cells . These studies suggest that MSCs could participate directly in the structural regeneration of dermal and epidermal tissues, thus representing an additional mechanism by which the MSCs may promote cutaneous wound healing. In this review, we have highlighted many recent scientific findings that illustrate the cellular mechanism by which MSCs participate in and enhance the process of wound healing with the potential to minimize the formation of scar tissue. Although it is unlikely that MSCs can replicate the mechanisms of scar-less wound healing that occur in fetal dermal tissues, they may still re-initiate or promote some of the processes that characterize fetal wound healing. There is also emerging evidence that MSC phenotype can be polarized by inflammatory environments, and suggests a paradigm for MSC function mirroring similar behavior in T cells and macrophages . These studies indicate that MSCs respond to inflammatory cytokines by modulating the expression levels of Toll-like receptors, thereby attenuating the immunosuppressive biochemical signaling that is typical of MSC populations . A better understanding of how MSCs interact with and regulate the resident immune cells in the wound will facilitate their clinical translation for wound healing applications. In a recent review , we have summarized the recent pre-clinical and clinical studies designed to evaluate MSCs as a cell therapy to improve wound healing, and a summary of these studies is provided in Table 1. Based on a variety of small and large animal studies, a growing body of evidence suggests that MSCs provide significant benefit during dermal wound healing, as they can (1) accelerate the rate of wound closure and re-epithelialization, (2) improve the quality and strength of the regenerated tissue, (3) recover wound healing pathologies that might otherwise result in a chronic, non-healing wound, and (4) minimize the visual appearance of scar tissue. In spite of these encouraging pre-clinical findings, there are currently only four active clinical trials pertaining to the treatment of dermal wounds with MSCs . This is evidence of several substantial barriers that still exist that limit the clinical translation of MSCs, including a scalable cell-sourcing platform, a means of cell delivery (reviewed in ), and a predictable regulatory framework. In this review, we have brought attention to the promise of MSCs as a therapy to improve cutaneous wound healing and the need for new technologies to overcome these barriers and enable the clinical use of MSCs in wound healing applications. ASC, adipose-derived stem cell; MSC, mesenchymal stem cell. Supported in part by the National Institutes of Health Intramural Research Program (Z01 AR41131) and from the Commonwealth of Pennsylvania Department of Health. Additional support provided by the Department of Defense Military Amputee Research Program at the Walter Reed Army Medical Center (Department of the Army, Grant No. PO5-A011), the Peer-reviewed Orthopedic Research Program (Department of the Army, Grants No. W81XWH-10-2-0084 and W81XWH-10-2-0085), and the Defense Medical Research Development Program (Department of the Army, Grant No. D10_I_AR_J8_981), for which the U.S. Army Medical Research Acquisition Activity 820 Chandler Street, Fort Detrick MD 21702-5014 is the awarding and administering acquisition office. The views expressed in this manuscript are those of the authors alone and do not represent the views, policies or official positions of, nor should any official endorsement be inferred on the part of, the United States Government, the United States Army, the Uniformed Services University of the Health Sciences (USU), or the Department of Defense. Nor do they represent those of the National Institutes of Health or the Department of Health and Human Services. Figure one was produced using Sevier Medical Art.